NASA's Mars rover, Opportunity, has been seen, but still not heard. A spacecraft around Mars has sent back a photo of Opportunity, which has been silent ever since a massive dust storm engulfed the red planet in late spring. The rover appears in the photo as a pale dot. ’Oppy shows up as a blip on the slopes of Perseverance Valley in a color image captured Sept. 20 by the Mars Reconnaissance Orbiter’s High Resolution Imaging Science Experiment, or HiRISE, from a height of 166 miles. ’’The orbiter’s clear view raises hopes that winds will sweep dust off Opportunity’s solar panels, as has happened several times before, and allow the rover to build up enough power to resume transmissions. ’Mars’ storm-dimmed skies caused power levels to fall in mid-June, eventually forcing Opportunity to cut its power consumption down to the bare minimum. The rover is equipped with plutonium-powered heating units, which should have helped keep it from freezing, but the power drain cut off communication links with Earth. 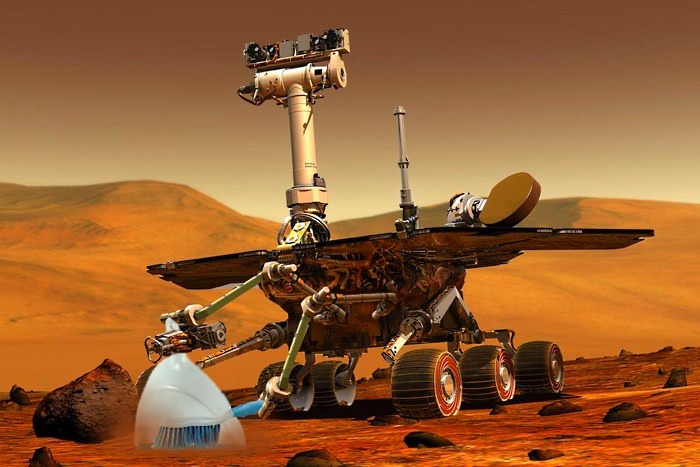 I'm sure NASA has plans to send a modified version of the rover with new appendages that address the problems which past experience has made them aware of.